B2B marketers are continuously facing challenges with today’s marketing landscape. According to Econsultancy, marketers on average are using 21 or more digital marketing products. Without one source of truth, B2B marketers are unable to provide personalised interactions, leverage artificial intelligence, and gain actionable insights needed for sales teams to close more deals. However, with the right solution in place, marketing and sales can align to focus on the same goals and drive more revenue for their business. Join us as we share tips and best practices for finding more leads, closing more deals, and maximising marketing ROI by connecting sales and marketing to grow your business faster. Find and nurture more leads with smart digital advertising and powerful marketing automation. Today’s consumer expectations are upending the industry’s approach to retail, and brands must evolve quickly to avoid irrelevance. To help you navigate this shifting landscape, SapientRazorfish and Salesforce have joined forces to reveal new patterns in shopping behavior and new opportunities for retailers like you. This study is based on the activity of more than 300 million online shoppers, 6,000 consumer survey responses from shoppers in six countries, and dozens of interviews with retail experts. Alignment between Sales and Marketing is potentially the largest opportunity for improving business performance today. When sales and marketing teams unite around a single revenue cycle, they dramatically improve sales productivity, marketing ROI and, most importantly, top-line growth. Join this Webinar to hear how the Pardot marketing team used Pardot's B2B Marketing Automation platform + Salesforce Engage to put the power of marketing automation in the hands of our sales reps.
Join us to learn how Nathan Haines, Managing Director at Element 26 empowers a team of 20 to deliver a fast, seamless experience across marketing, sales and service. See first-hand how Quip is used to enable cross-functional collaboration for the sales process, and then on to service delivery. The fourth industrial revolution is changing how we live, work, travel and trade. Customers are more connected than ever before, and the rise in connected technologies has resulted in endless amounts of valuable data. Terence Sorrell, Global Business Design Manager, Hive & our host Mark Orsborn, Senior Director, Salesforce IOT discusses how Hive is unlocking valuable data with the Salesforce Platform, to deliver global customer success. The first-time fix can be a very powerful customer experience. But for many field service organisations, nailing that initial visit is harder than ever. Wherever you look - from healthcare to finance to manufacturing - you'll notice that field service teams are in need of a helping hand and are looking for a solution. Watch this webinar to hear from Daikin Applied UK's CRM Manager, John McCarthy, as he discusses the company's transformation journey which has enabled them to connect the business, optimise their workforce and engage on mobile. Salesforce is the global leader in customer relationship management (CRM), bringing companies closer to their customers in the digital age. Founded in 1999, Salesforce enables companies of every size and industry to take advantage of powerful technologies—cloud, mobile, social, internet of things, and artificial intelligence—to connect to their customers in a whole new way. 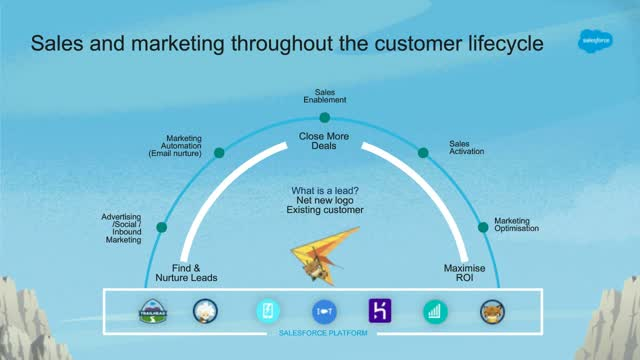 The Salesforce Customer Success Platform includes industry-leading services spanning sales, service, marketing, commerce, communities, collaboration and industries, all on a single trusted cloud platform. Salesforce will power more than 2 trillion B2B and B2C transactions this year for more than 150,000 companies and millions of Trailblazers--the individuals and their organizations who are using Salesforce to drive innovation, grow their careers and transform their businesses. Salesforce is committed to a set of core values--trust, growth, innovation, and equality of every human being. The company is ranked #1 on Fortune’s World's Best Workplaces list, and Forbes has ranked the company one of the world's most innovative companies for eight years in a row. For information, please visit www.salesforce.com.